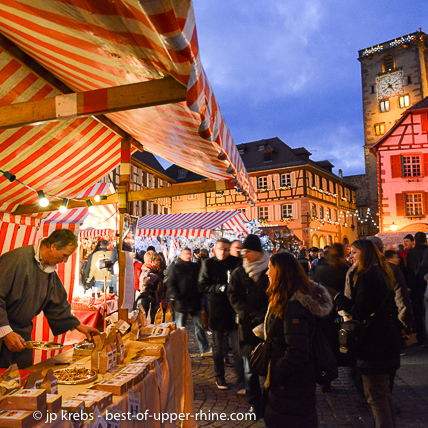 In Riquewihr, Christmas markets are starting as early as Friday evening, 2019, Nov 29. Riquewihr is definitely a fairy tale village. Christmas lights and markets from end of November to end of December every year. 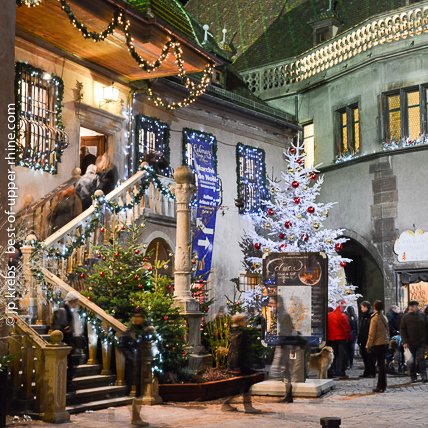 La Guinguette de Noël is a private Christmas market held in a historical winemaker's property in the heart of Riquewihr. Enjoy the Christmas markets on weekdays and as soon as end of November: no crowds, more pleasure. Every year we take some new pictures on several Christmas markets and events related to Christmas in Alsace and nearby Germany. We listed our favorite attractions and venues on a long page with hints, practical tips and links. Could be helpful to organize your own stay in Alsace. Have a look at our dedicated page on our blog. Stay in one of our 15 wonderful holiday apartments and experience an unforgettable Christmas atmosphere. Click here to access all availabilities and book online. 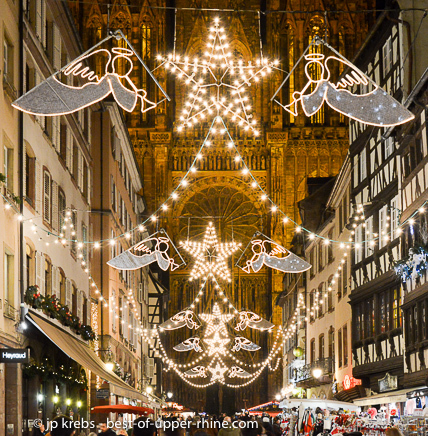 The Christmas markets and celebrations in Alsace start every year with the first Sunday of Advent. Usually, festivities start on the last weekend of November. This Christmas markets atmosphere will last until beginning of January. 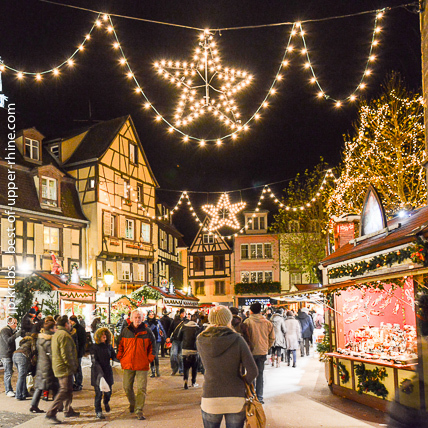 By booking one of our holiday apartments in Riquewihr you will be ideally located to discover the Christmas markets all over Alsace and even nearby Germany. 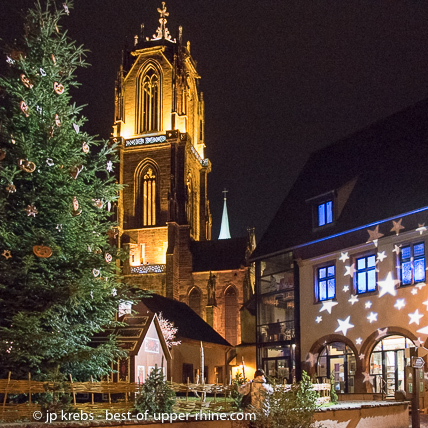 For more pictures and a precise 2019 Christmas events update in Alsace and nearby Germany and Switzerland, read and follow our blog. Main street of Riquewihr. Our holiday apartments Marco Polo, Riesling, Muscat, Sylvaner and Klevner are in this part of the street. 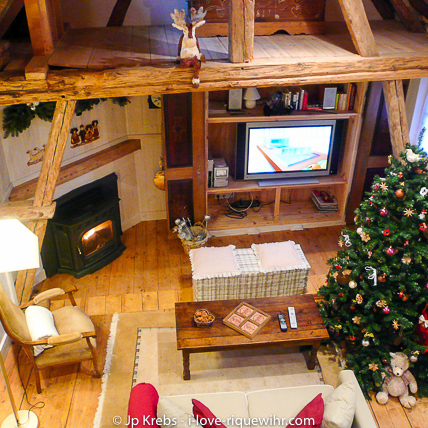 Discover Alsace Christmas Markets by staying in our OLD WINERY Property facing the vineyards! The "Old Winery" is a collection of 6 outstanding romantic and luxury holiday homes: 4 of them are located in a big Renaissance house (actually a winery built in 1580) on the first belt of the ramparts (built 3 centuries earlier in the year 1291). The property is facing the famous Schoenenbourg Grand Cru vineyard producing some of the best Alsace wine; 2 other apartments are in a 17th Century adjacent house. The houses are surrounding a small garden. The Old Winery earned a Golden Award for the quality of the renovation works. These holiday homes belong without any doubt to the finest vacation rentals in Alsace. The Little Wolf ***** - Romantic luxury gite for 2 people. With 2 small balconies. Ideal for a romantic stay in every season. Description of the gite. Online booking. The Fox and the Grapes ***** - Romantic luxury gite for 2 people. Facing the most famous vineyard. Ideal for a romantic stay in every season. Description of the gite. Online booking. The Alsatian Hart ***** - Large luxury apartment for 2 couples. 2 beautiful bedrooms + 2 bathrooms. Beautiful views. Description of the gite. Online booking. The White Stork ***** - Outstanding luxury gite for 2 people. Private terrace. Beautiful views. Description of the gite. Online booking. The Little Bear ***** - comfortable apartment for 2. Street level, ideal for people having problems to walk or to climb stairs. Description of the gite. Online booking. The Lucky Dragon ***** - spacious luxury apartment for 4+2 people. Terrace. Independant entrance from the garden. Description of the gite. Online booking. All apartments on this side are designed and equiped to offer you the best. They earned an official 4 and 5 stars rating. Four of them have a private winter garden, a balcony or even a terrace which is a seldom opportunity in a medieval national heritage building. 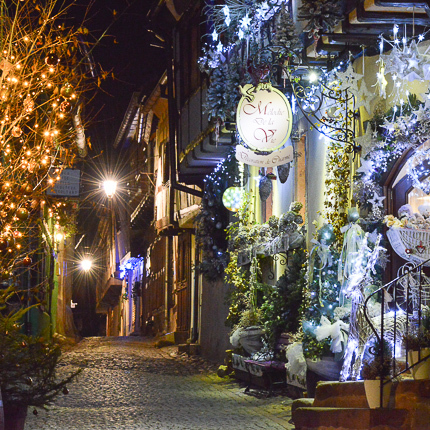 Imagine one of the prettiest villages in France combined with the fairy tale of Christmas! 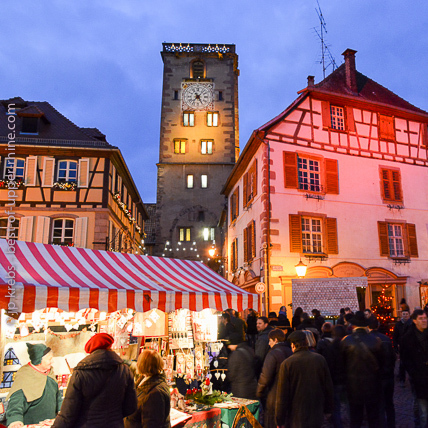 Here are some pictures of the Christmas market in Riquewihr. The stalls of the plaza near the City Hall as well as several Christmas markets in private courtyards are open daily. Prefer weekdays as the village will be less crowded and you will enjoy the magical atmosphere more. 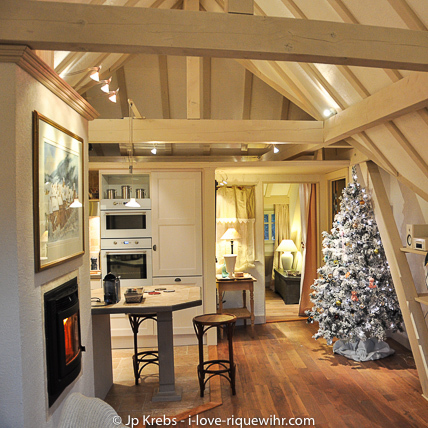 Christmas and Winter atmosphere in our romantic holiday apartments in the medieval village of Riquewihr in Alsace! Our self catering gites in Riquewihr are wonderful places to stay in Winter. In the lounge of the Dove's Nest as well as in the White Stork (2 persons) you will have a safe pellet fireplace. During the Christmas markets period (end of November to January), all our apartments, from the smallest studio to the largest flat, have a beautiful romantic Christmas decoration. We have guests coming from all over the world especially for the Christmas markets period. Availabilities in our holiday apartments are vanishing rapidly. For even more fun, make your explorations during weekdays. The Christmas markets will be less crowded. Book one of our romantic gites as soon as possible to avoid disappointment. Click here to see all availabilities! 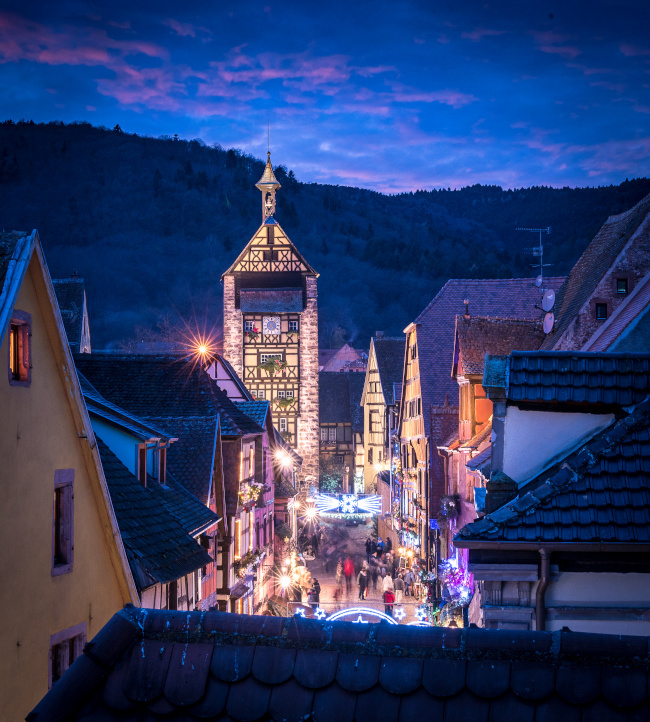 Riquewihr and the small towns and surrounding villages as Ribeauvillé, Kaysersberg, Eguisheim but also smaller and less known villages are a genuine delight during the festivities and Christmas markets. 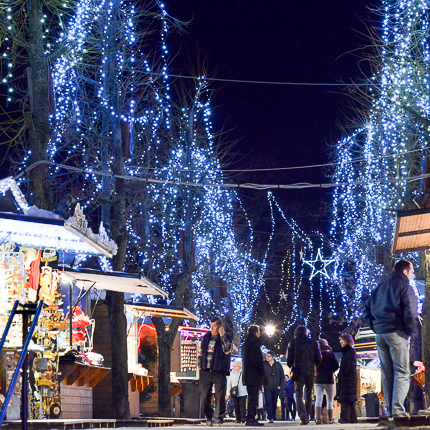 The Christmas markets time extends from late November to Christmas and even into the New Year (Colmar). The streets are decorated with many small trees and lights: delightful decorations so that the magic of Christmas is everywhere. 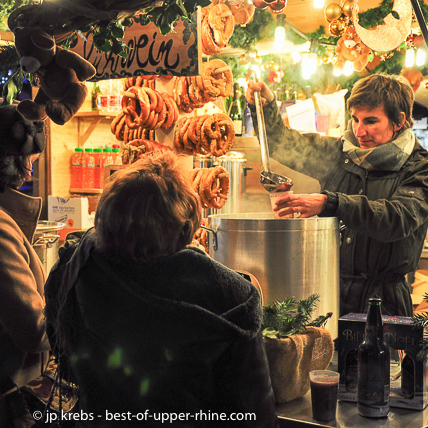 Everywhere, on each christmas market, you will have the opportunity to sample specialties from Alsace directly in the street like that traditional sweets prepared at home or Glühwein (warm wine prepared with spices). Nativity scene in Bergheim near Riquewihr. Every year a crib's trail is showing about 50 nativity scenes until January. 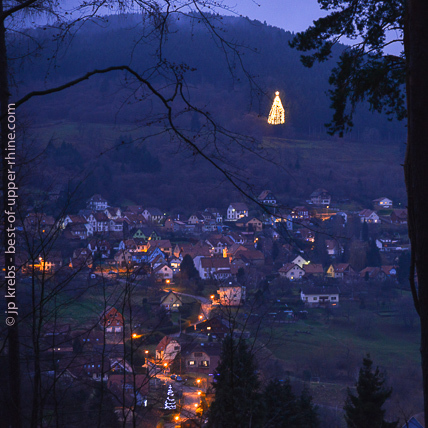 A giant Christmas fir is lit at the edge of the forest of Grendelbruch near the Mount Saint Odile. 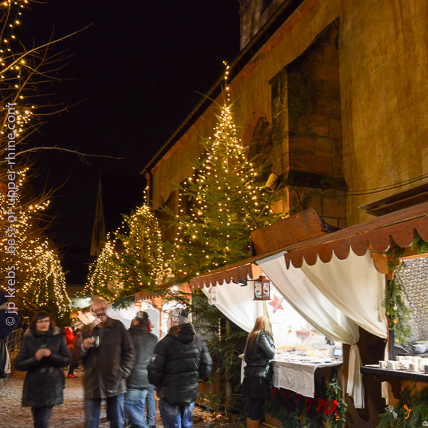 The Christmas market in Eguisheim, south west of Colmar, deserves a visit. See my blog for details. South West of Strasbourg, in Germany, the giant Advent calendar of Gengenbach and its Christmas market should be visited at the end of the afternoon. 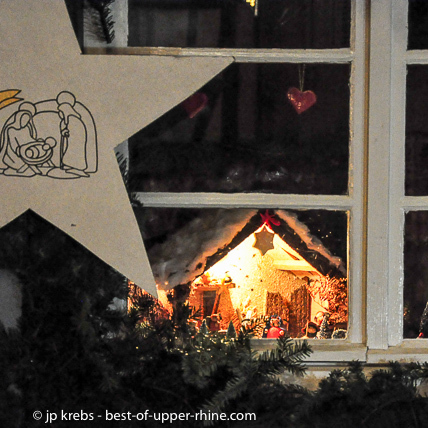 For more Christmas events in Alsace and nearby Germany and Switzerland, read and follow our blog. 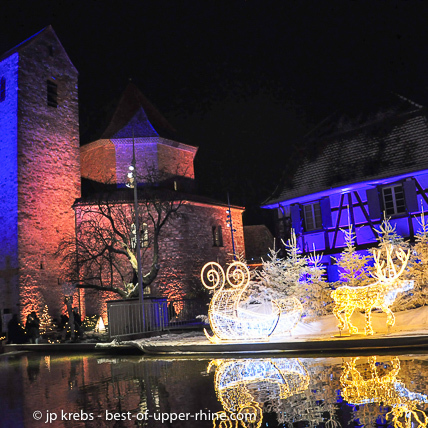 Ottmarsheim, between Mulhouse and Basel presents the only Christmas market where museum shops are gathering. 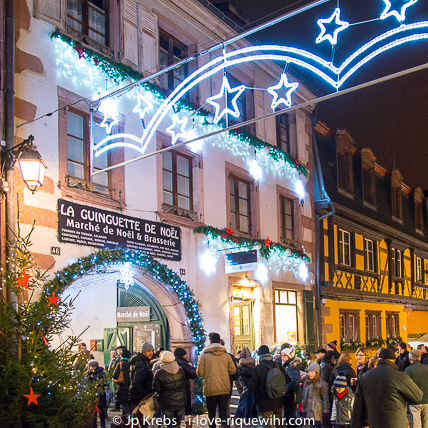 Mulhouse organises a spectacular Christmas market usually open as soon as end of November. A collection of 3 beautifully renovated romantic holiday gites in a historical and unique environment: the second belt of medieval ramparts of Riquewihr, built in the year 1500. The Western side of our properties are part of the ramparts. On the eastern side, in the picturesque 'rue des Remparts', the house appears as a traditional Alsatian timber framed house. These holiday homes belong also to the finest gites in Alsace. Gite The Dove's Nest ***** - Romantic luxury holiday house for 2-5 persons. Official 5-star classification. One of the finest places to stay in Alsace. Adults or grown up children only. 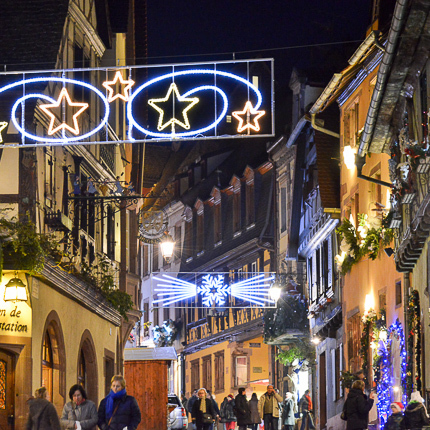 The Christmas markets in the neighbour towns of Colmar are only minutes away from Riquewihr. Christmas market in Colmar. Colmar is a beautiful city with famous Christmas markets. 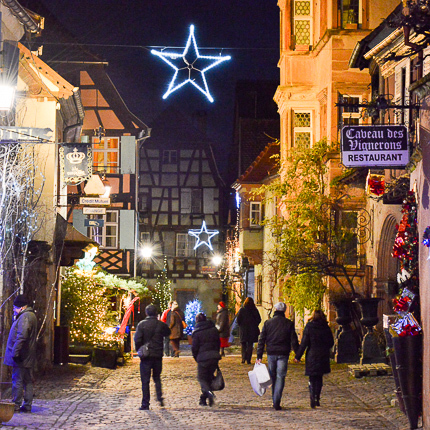 The magic of Christmas operates in Colmar at any time of the day but especially at night. 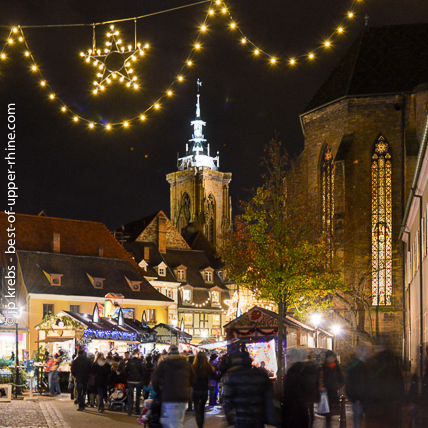 In 2019 the Colmar Christmas markets open on Friday afternoon 22 November 2019 and will last until end of December. 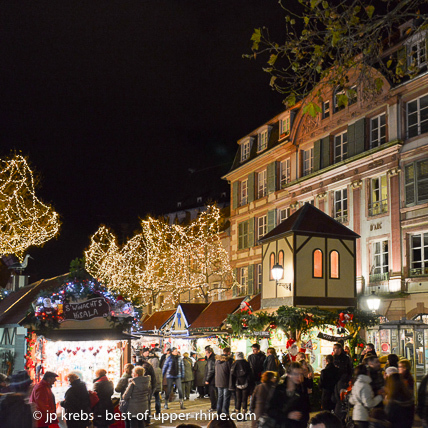 One of the 5 Christmas markets of Colmar - only minutes away from Riquewihr and our apartments. Christmas market atmosphere in Colmar. Colmar is within an easy reach by bus from Riquewihr. No need to take your car and bother for parking! 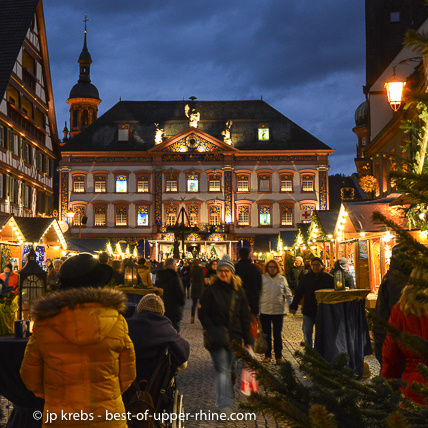 The nearby little towns of Kaysersberg and Ribeauvillé are 15 minutes away from Riquewihr and organise every year beautiful Christmas markets. There is a Christmas shuttle taking you there. No need to take your car. 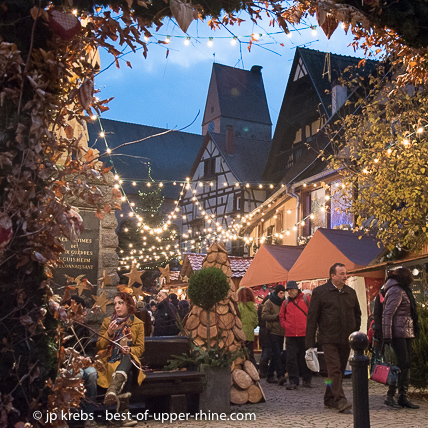 In Kaysersberg, charming little city near Riquewihr, Christmas markets are famous and crowds are filling the streets every weekend in December. When the weather is chilly, Glühwein is the best medication to warm up hands, mouth and heart! Ribeauvillé has a long history. Medieval times are surviving through the architecture but also through festivals all over the year, included the Christmas time. In Ribeauvillé, Christmas markets are... medieval. 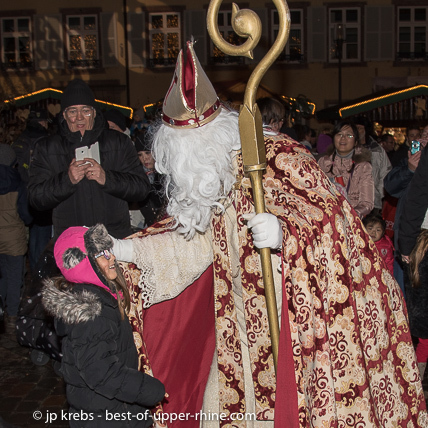 Saint Nicholas visits the Christmas market in Selestat near Riquewihr Sélestat is a must visit little city only 20 minutes drive north of Riquewihr and Colmar. Do not miss the Procession of Saint-Nicholas and opening of the Christmas market. Spectacular night parade in the streets of downtown (from 16:00 usually), speech by the saint patron of schoolchildren and distribution of sweets and hot chocolate to good children. Sélestat remains a city somewhat unknown to tourists. Perhaps because they often rush on the highway from Strasbourg to Colmar without thinking of stopping at Sélestat. What a pity! Sélestat is a beautiful city with a rich historical and architectural heritage. Christmas animations are nice and tidy. It is also the historical birthplace of the Christmas tree, with the oldest written reference in the world dating back to 1521. The Saint Nicholas parade is probably the most beautiful of that kind in Alsace and is attended by many kind children waiting for sweets! A collection of 5 new holiday gites in the heart of Riquewihr. Four apartments are located above a famous historical wine cellar. These 4 gites just came out of renovation and decoration works. The Marco Polo gite is a very large apartment on the opposite side of the street, in one of the most beautiful National Heritage houses in Riquewihr. Gite Sylvaner **** - Charming holiday studio for 2 persons. Gite Klevner - Another charming holiday apartment for 2+1 persons. Gite Muscat - A larger charming holiday apartment for 2+3 persons. 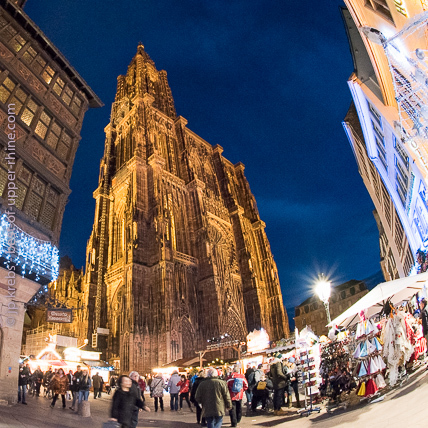 Do not miss an afternoon at the Chrismas markets in Strasbourg. They are definitely the oldest tradition of Christmas markets in the world and are held since 1570! Catch a train at the station in Sélestat or drive to the P+R parking and tram station of Illkirch-Grafenstaden south of Strasbourg. Do not attempt to enter Strasbourg with your car, it would be a nightmare. Check our blog for more practical details. 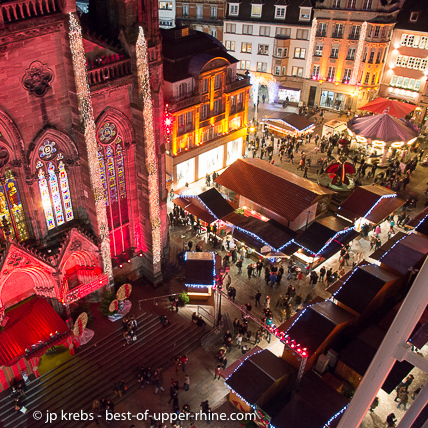 The impressive cathedral of Strasbourg dominates one of the 11 different Christmas markets of the city. Winter is the season of traditional Alsace. Mid November, January and February offer plenty of discoveries for those who know how to look and approach closer. 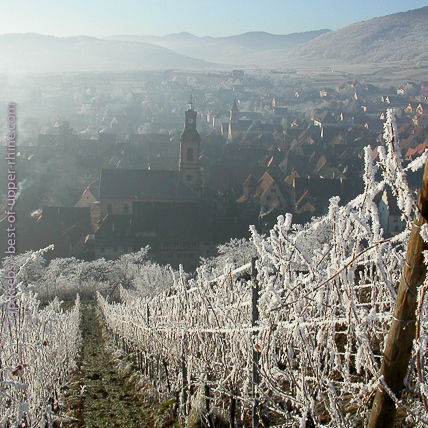 Riquewihr is your base for exploring the vineyard and the mountains of Vosges and Alsace! In the aftermath of the Epiphany, the Feast of the Magi, 6 January, when the celebrations of Christmas fade in our memories, when the lanterns have been removed and the new year has begun its march towards Easter, then another Alsace unfolds. Some find it more authentic, far from the tumult of the crowds of the beautiful days. 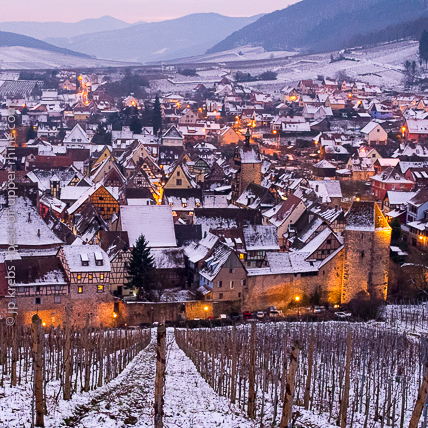 Snow is not present every year but when it is, it gives a very special atmosphere to the village of Riquewihr and to the Vosges mountains. La Vancelle is a beautiful residential village only 25 minutes north of Riquewihr. If calm, rest, silence and nature - while being near to all important places to see, including the Alsace wine route (only a 10 minutes drive) - are important for you during your holidays in Alsace, you should definitely have a look at our Mountain Hiker holiday home in La Vancelle.